1. Physicality: Story maps work best when you have a lot of physical space to lay them out. E.g. on a big wall, or a large floor. The challenge is that for a project of any reasonable size there is no good tool available to digitally represent Story Maps. 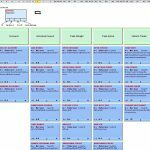 The project manager’s ‘Swiss Army knife’ of the spreadsheet is always available, but a tool tailored to the purpose of producing Story Maps would be a great asset. There is also Prezi (http://prezi.com/), which allows massive presentations to be viewed and navigated. 2. Beyond the Inception phase: In a sense this is allied to the first challenge, that while producing a plan of iterations and releases at the Inception stage is a great utility to have at our disposal the ongoing story backlog then needs to be managed. JIRA and Greenhopper (http://www.atlassian.com/software/greenhopper/overview) are great tools to manage Sprints in an Agile way, but if there were a tool that could directly use the initial Story Maps, or manage a Story Map as a backlog then that would be even better, and more efficient. There is the possibility that SpecLog (http://www.speclog.net/) may be able to fill this niche, or do you know of some other tool that could be used? In part 3 we revisit stories and story maps, and report back on a new tool we saw at a conference and compare it against our spreadsheet for managing the story backlog. good summary about story maps! There is a simple live demo, too – I am curious, what do you think about.. Blueprint is a toll that looks a stronger match for the analytical artifacts from Requirements to Stories to Use Cases all linkable with IM-type user collaboration features. It looks incredibly user firendly with integration to JIRA and QC. Unfortunately my project is too far advanced to use it here at Barclays. Story mapping is a proven backlog management method. 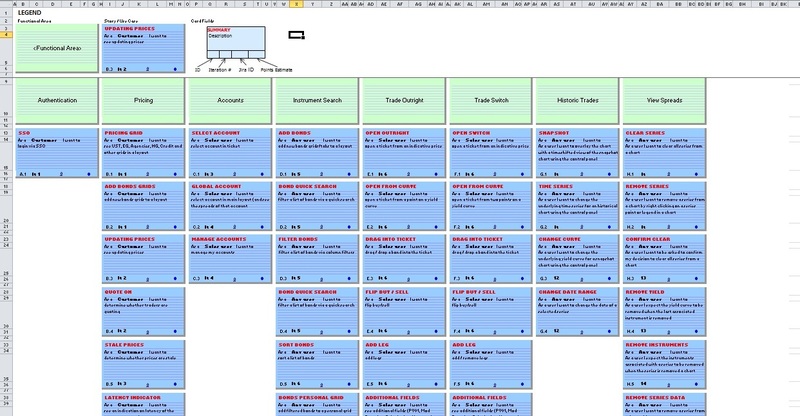 Digitization of story mapping is a powerful way to turn a story map into a project. With FeatureMap – http://www.featuremap.co – Product Owners have an augmented solution to define, manage, collaborate and communicate on their backlog. Adding a 2-ways real-time synchronization with JIRA bridges bridges Product Management and project management. The Product Owner controls and drives the project scope while project team reports directly on the visual backlog the project progress. It results in more visibility and communication and consequently better decisions and better products. Previous Previous post: What do developers keep in their toolbox?